Stitch to Enrich, a new club at BSGE, held its first meeting on Thursday, November 5th. The club, created by Amelia Chen ‘18 and me, Camilla Khan ‘18, combines art and community service. Club meetings are held every Thursday from 2:15 to 3:15 in the art room with Mr. Sheridan as the club advisor. During this time, students learn how to sew stuffed animals that will eventually be donated to children’s hospitals in New York City. No previous sewing knowledge or experience is required. 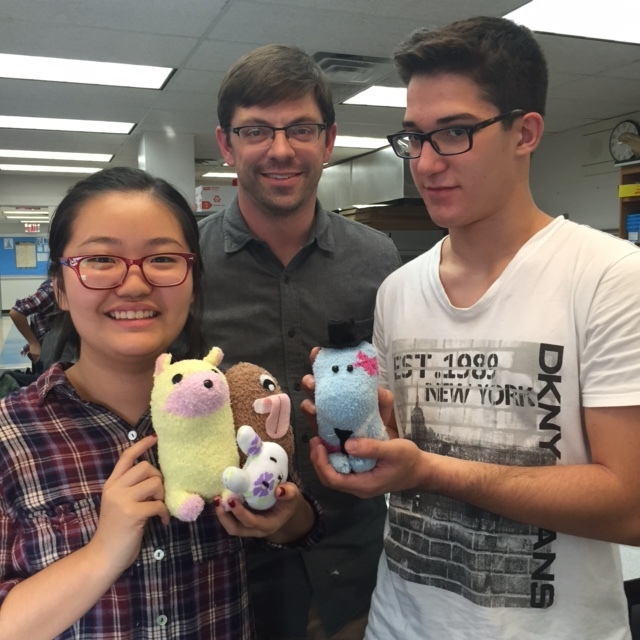 The club will teach its members how to design and sew stuffed toys in no time. Amelia and I chose to create this club because we wanted to give back to our community. We came up with the idea of stitching our own stuffed animals to donate because we wanted to do something different from other programs at BSGE like the annual Toy Drive, Penny Harvest, or the Food Drive. By having students design and put together the toys, they express their dedication to helping their community. It would, of course, be much easier to simply purchase the stuffed animals but taking the time to create them demonstrates students’ care and kindness through their hard work. Students seemed to be a bit skeptical about joining this club, but once they did they got to enjoy it. Ben Bagbek ‘18 says, “At first I didn’t think the club would be that interesting but since I was curious I joined the club anyways. I really enjoyed the first meeting and continue to go every Thursday. It’s super fun and I’m glad I joined!”. We promise you will enjoy the time spent creating stuffed animals and toys and you will be putting smiles on children’s faces while doing so. Besides bringing fun and fulfillment while exploring your creativity, Stitch to Enrich can gain you CAS hours. If you’re interested or have any questions, feel free to email me or Amelia at 18khanc@bsge.org or 18chenam@bsge.org. Stop by the art room this Thursday to check it out. We look forward to seeing you there! Previous Post The Buzz: What do teachers want for the holidays? Next Post Water on Mars!